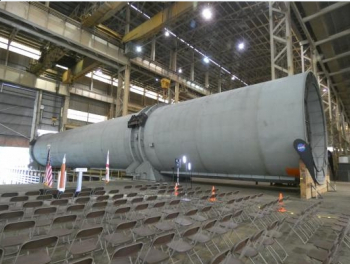 A full-scale model of a Space Launch System (SLS) Core Stage, called the Core Stage Pathfinder, was recently completed at a plant in Northern Alabama, and will soon be shipped and turned over to NASA. A ceremony was held to mark the completion of construction and assembly of the gigantic steel article at G&G Steel’s even more enormous facility in Cordova, Alabama. Radiance Technologies and Dynetics were contracted by NASA to build and deliver the Pathfinder; G&G Steel performed the final welding and assembly of the steel structure. The companies will turn over Pathfinder to NASA after they deliver it by barge from G&G’s Cordova facility on the Black Warrior River to the Michoud Assembly Facility (MAF) in New Orleans, Louisiana, sometime in the next month or so. NASA will use Pathfinder at MAF, the Stennis Space Center (SSC) in Mississippi, and the Kennedy Space Center (KSC) in Florida to practice handling the size and weight of a fully assembled SLS Core Stage at those different locations and transportation between them before they have to start doing it with the real thing as early as next year. The Pathfinder was designed to mimic the “form and fit” of a real Core Stage. It has the same weight, center of gravity, size and shape as a finished, empty SLS Core Stage, which is how the rocket will be delivered by barge from MAF to Stennis and/or KSC. The Pathfinder weighs about 228,000 pounds, is about twenty-seven and a half feet in diameter, and about 212 feet in length from the top of the forward skirt to the bottom of the engine nozzles. 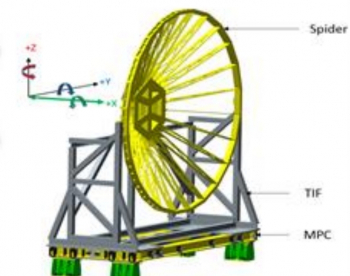 “This has all the interfaces that we need at all different facilities and all different GSE (Ground Support Equipment) for transportation,” Tim Flores, integration manager for the SLS Stages Element Office, said in an interview at the event. 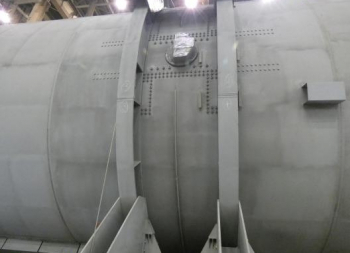 In addition to things like SRB attachment fittings, the Pathfinder has or will have elements that simulate some of the larger protuberances on the outside of the stage, such as the systems tunnel and the liquid oxygen feedlines, also known as downcomers. Both the systems tunnel and the two downcomers run along most of the length of the stage. Pathfinder has wire-frame simulators of the RS-25 engine nozzles at the bottom of the stage, with fins forward of that to simulate the boat tail fairings. “They made the [simulated] engines [so] there’s one little piece that sticks out a little bit further and I believe that just gets the dimension of that without putting the whole fairing there,” he added. After the Pathfinder gets to MAF, the remaining simulated elements that need to be added will be attached there. “There’s some additional hardware that is very low fidelity that they’re not going to add until it gets [to MAF] and that is the downcomers,” Flores noted. “They’re going to add that, but they’re not going to until they get there, because it’s very flimsy. Although the Pathfinder is just as large and heavy as a Core Stage, it is not structurally engineered like one. “It’s just form and fit, it’s not function,” Flores added. 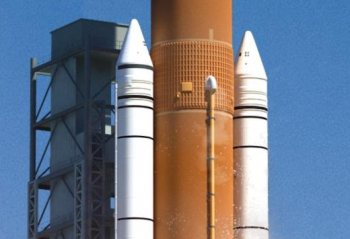 For the testing that NASA has planned, the article will also keep its current flat gray primer appearance, in contrast to the foam-covered, orange and white real thing. “All we’ve got on it right now is primer,” Flores explained. 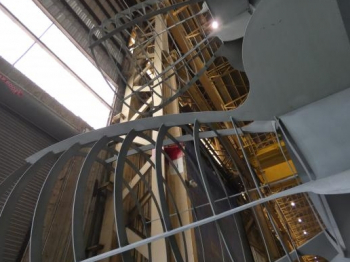 In addition to the Pathfinder, G&G Steel is completing two massive lift “spiders” at the Cordova facility that will also soon be delivered to NASA. One of the spiders and a lift ring were on display at the ceremony and the second spider was being completed elsewhere in the facility. “The spiders are used in two different places,” Flores explained. “[They are] used at Stennis to lift and break over and also in the VAB they’ll use it there. The lift ring goes in between that and the front face of the forward skirt and it’s got the mechanism to be able to put a weather cover on it also. The spiders themselves are big and weigh about 45000 pounds each. “It is beefy structure,” Flores said, noting that the spider is too heavy to leave bolted on the structure when it is oriented horizontally. The Pathfinder and the lift spiders will be delivered to NASA on commercial barges, leaving Cordova once some final work is completed. “[In] about two weeks, give or take,” Sam Stephens, manager for wet structures in the SLS Stages Office, said at the event regarding the timing of the departure. Once at MAF and turned over to NASA, the Pathfinder will start off outside. “One of the first things that we’re going to do at MAF is, you see the SRB fittings that are on there, it’s actually complicated to get those things pinned and get some of the hardware on that to actually run with the GSE and for the Boeing lifting capability,” Flores explained. While at MAF, the Pathfinder will give NASA and Boeing a chance to practice and improve the operational sequences to deliver a completed Core Stage at the end of production. “What we want to do over at MAF is actually run through the paces between Boeing’s final assembly and then going from there over to our GSEs, Flores explained. “They are going to be assembling a Core Stage and then it will be put from their rigs over to our GSE. We want to go through those paces, so that’s one of the things we’re negotiating right now with Boeing to make sure that happens. 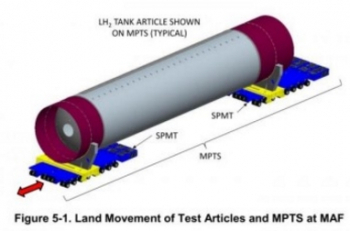 “One of the GSE systems that’s called the MPTS (Multipurpose Transportation System) will connect up to the SRB fittings and then one will connect in the back and we’ll pin in four places, just like the STAs (Structural Test Articles) so that connection on the Core Stage is exactly like we do on the STAs. Well, they’re not simple connections. We’re getting to practice right now with pinning on the back end – or we will – with the STAs and something we call the DDU (Dynamic Demonstration Unit). Robotic, motorized transporters called self-propelled modular transporters or SPMTs will pick up the MPTS that the Core Stage attaches to. Once the stage is placed and secured on the SPMTs, it can then be rolled along an approximately mile-long road route on MAF property, out from Building 103 to the dock where NASA’s Pegasus barge is. The SPMTs will then be used to roll the stage with its GSE onto Pegasus, where they will be physically secured. The Pathfinder is configured so that personnel at MAF can practice this series of steps multiple times and in both directions between Final Assembly and Pegasus. 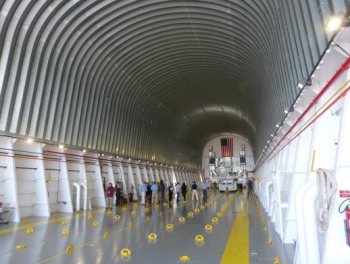 Early next year, the plan is for the SPMTs to move Pathfinder onto Pegasus and after it is secured, the barge will be taken from MAF to the relatively nearby Stennis Space Center in Mississippi. 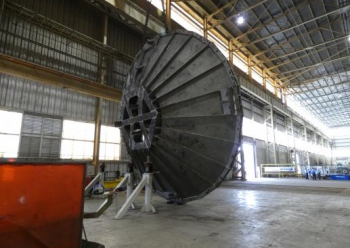 The barge will travel to the B-1/B-2 test stand at Stennis, where the renovated and extended B-2 stand is being readied for Core Stage green run testing. Given that Pathfinder simulates a Core Stage’s form and fit, this will be an early exercise for the Pegasus barge crew making a trip with its largest, heaviest payload, and also gives them a chance to evaluate their transportation plans. As at MAF, Pathfinder will allow personnel at Stennis to practice handling operations there. Just like the real Core Stage, Pathfinder will be rolled off the barge at Stennis and lifting GSE (including one of the lift spiders) will help cranes attach to it. The article will be lifted up off the SPMTs and rotated to vertical; this “break-over” operation will be practiced multiple times. The Pathfinder will then be lifted up and into the B-2 stand where the attach fittings will be used to bolt it into the stand. The opposite sequence of removing the Pathfinder from the stand, breaking it over from vertical to horizontal, putting it back on the transportation GSE, and rolling back onto the barge will also be practiced. “We’ll practice lifting it, breaking it over, and then putting it into the B-2 stand. Hopefully, we can go through that process two or three times at least,” Stephens said. Unlike the real stage that has umbilical panels where all the required services can be fed into the rocket, the Pathfinder has only stickers or placards to indicate their locations. Once all the handling tests at Stennis are complete, the Pathfinder will go back onto Pegasus, which will make the much longer voyage from Stennis to KSC, giving the Pegasus crew an opportunity to practice the same trip they will take with the real Core Stage after green run testing is complete. At KSC, ground crews there will get a chance to test their handling procedures – rolling the Pathfinder on the SPMTs off the barge at the upgraded Turn Basin at Launch Complex 39 into the VAB Transfer Aisle, where crane operations can be tested. 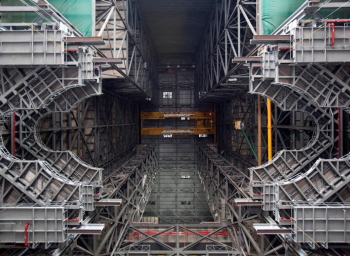 The Pathfinder will allow lift to mate operations in the VAB to be practiced, where the stage will be lifted off the SPMTs in the Transfer Aisle, broken over to vertical, lifted up towards the top of the VAB, through the High Bay 3 diaphragm, and down towards the deck of the Mobile Launcher. In the case of Pathfinder, there won’t necessarily be anything it can attach to during these practice dry-runs. “It’s not set up to actually connect to the boosters,” Flores explained. Although the reason for Pathfinder’s existence is still in front of it, there has been some thought about a final resting place when its work is complete.